Home / Blog / 3D Print your own Pokémon Pikachu today! 3D Print your own Pokémon Pikachu today! This 10 inch tall 3D print of a “low poly” Pokémon Pikachu was printed for a silent auction, but I thought it would be fun to post! For all of you Pokémon Go fans, this is for you! 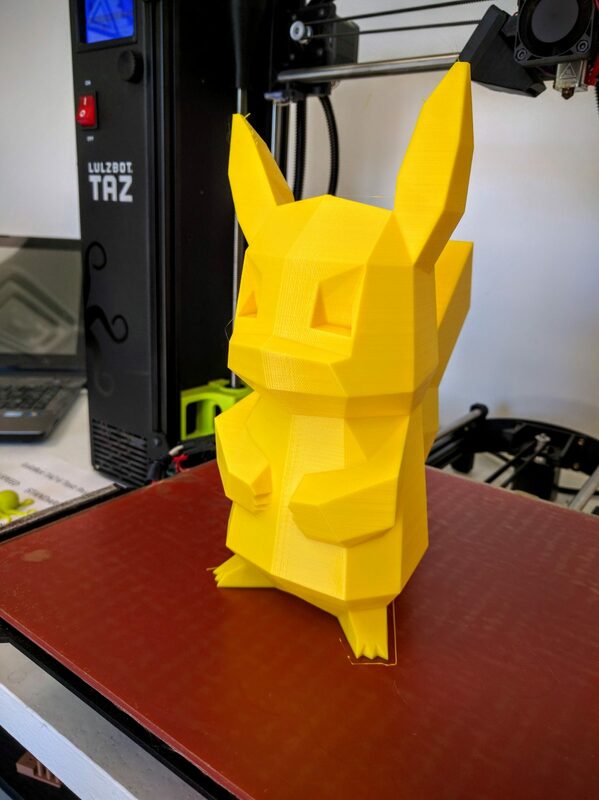 It is a low poly Pikachu printed in yellow PLA on a Lulzbot TAZ 6 3D printer. PLA is one of the most commonly used filaments in 3D printing because it is so easy to use. PLA has minimal warping and shrinking compared to other materials, which means it thrives when making objects featuring flat surfaces and hard angles, or requiring tight tolerances for fit. 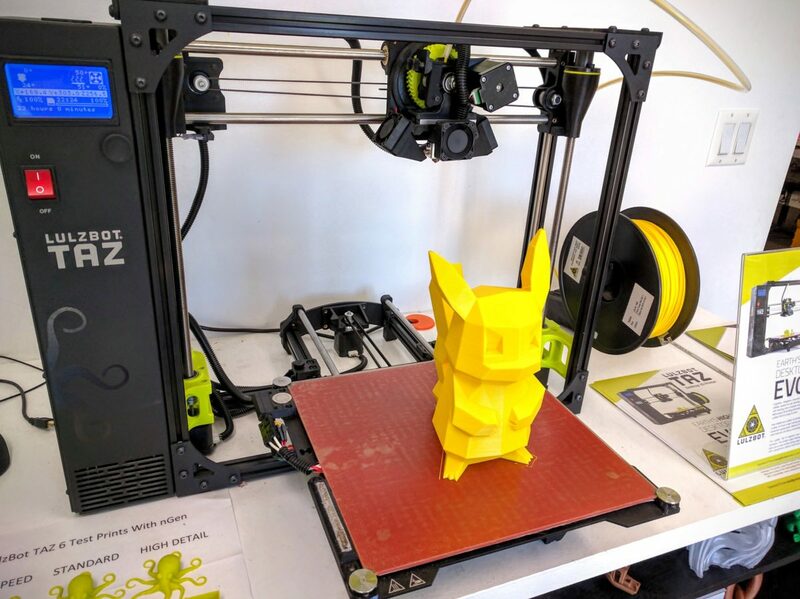 The Lulzbot TAZ 6 is also available refurbished here. You could also scale this print down and print it on a Lulzbot Mini 3D printer! Just look at all the fun you can have with a 3D printer! Whether you are a Pokémon fan or a hobbyist of some other kind, you can print one of a kind 3D prints to suite your needs! From figurines to replacement parts, a 3D printer is a useful tool to have around! We recently 3D printed something even more useful than this Pokemon, chair feet for a kitchen table. Pikachu are a species of Pokémon, fictional creatures that appear in an assortment of video games, animated television shows and movies, trading card games, and comic books licensed by The Pokémon Company, a Japanese corporation. Previous post: LulzBot TAZ 4 and TAZ 5 metal cased 500W power supplies are in stock!